All names will be put into a hat and we’ll draw the winners LIVE on Facebook on Friday 15th December at 11.30am. The only catch is that you HAVE to be watching the live feed for your name. If your name is drawn, you have to immediately comment so that we know you’re there! Otherwise, we’re afraid you’ll miss out and another lucky person’s name will be drawn. 3 prizes are up for grabs so head to Facebook and enter now! Go on Festive Britain, you’ve earnt it! 1. Eligibility: This promotion is only open to residents of the United Kingdom (England, Scotland, Wales and Northern Ireland), aged 18 and over, excluding employees of spoiltpig, Denhay Farms Ltd (the “Promoter”) and all those professionally associated with this promotion. 2. Promotion Period: The promotion will run from 07:00 on Monday 11th December 2017 until 23:59 on Thursday 14th December 2017. 3. 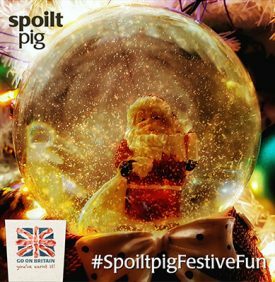 To Enter: visit the spoiltpig Facebook page, like and share the post and comment with #FestiveFun. 5. The Prizes: 2 packets spoiltpig smoked back bacon, 2 packets spoiltpig unsmoked back bacon, 2 packets spoiltpig smoked streaky bacon, 2 x spoiltpig money off vouchers, 2 x spoiltpig tote bag, 2 x spoiltpig keyrings, and 2 x spoiltpig fridge magnets. 2 Prizes: 2 x spoiltpig vouchers, 2 x spoiltpig fridge magnets, 1 x spoiltpig tote bag and 2 x spoiltpig trolley key fobs. A total of 3 prizes are available. 6. Winner Selection: Entrants who have to have complied with all promotional requirements will have their names put into a hat. During a live Facebook feed on Friday 15th December at 11:30am the draw for winners will be made. Winners must be watching the draw at the time of the feed and comment if their name is pulled from the hat. If, after 5 seconds, the name drawn from the hat has not been commented on, another name will be drawn from the hat. The first draw made with winner watching will win the main prize. The following two names drawn with winners watching will receive one of the secondary prizes each. 7. Winner Notification: Winner will be notified during live Facebook feed on Friday 15th December 2017. The winner will then be contacted via private message on Facebook to secure telephone number, postal address and email address. 8. Prizes will be despatched within 5 working days of address confirmation. 14. Winners may be requested to participate in publicity arising from the promotion but are not obliged to participate in publicity. 13. This promotion is in no way sponsored, endorsed or administered by, or associated with Facebook, Instagram, or Twitter. You understand that you are providing information to the Promoter and not to Facebook, Instagram, or Twitter. The information you provide will only be used for fulfilment of this promotion unless you have agreed to its use for any other purpose. By entering the promotion all participants agree to a complete liability release for Facebook, Instagram, and Twitter. 15. Aside from the use of entry data for the administration performance of this promotion, the Promoter will not use personal data for any other purpose without the express consent of the entrant. 16. The Promoter cannot accept any responsibility for any damage, loss, or injury suffered by any entrant entering the promotion, or as a result of accepting or participating in any prize. Nothing shall exclude the Promoter’s liability for death or personal injury as a result of its negligence. 17. If for any reason the promotion is not capable of running as planned for reasons (including but not limited to tampering, unauthorised intervention, fraud, technical failures or any other causes beyond the control of the Promoter which corrupt or affect the administration, security, fairness, integrity or proper conduct of this promotion), the Promoter reserves the right (subject to any written directions given under applicable law) to disqualify any individual who tampers with the entry process and to cancel, terminate, modify or suspend the promotion. 18. If an act, omission, event or circumstance occurs which is beyond the reasonable control of the Promoter and which prevents the Promoter from complying with these Terms and Conditions, the Promoter will not be liable for any failure to perform, or delay in performing, its obligation. 19. By entering this competition, all participants will be deemed to have accepted and be bound by these terms and conditions. 20. This promotion is governed by the English Law and participants submit to the exclusive jurisdiction of the English Courts.